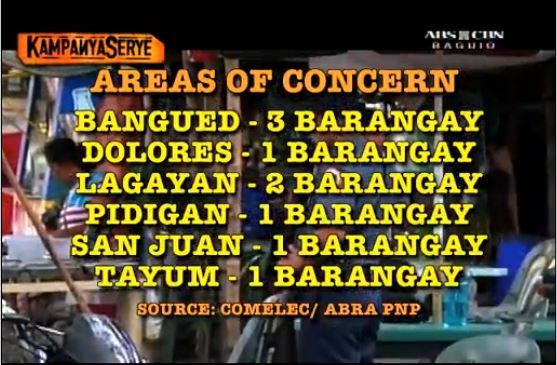 Barangay elections are supposed to be apolitical exercise but not in the case of Abra as reported by Dhobie P. De Guzman abs-cbn news. 1. 24 Incidents fo violence has so far been recorded. 4. Valera camp are beefing up their power with two more relatives running for Barangay Captain. Guns, Goons & Gold | Election Violence – KampanyaSerye | Halalan 2013 | ABS-CBN News. Oh well what can you do it’s Family Dynasty. Dakayo nga COMELEC, ipakatyo dayta linteg. I-disqualify yo dagita ag-partisan nga kandidato. Pati ni Gob ken dagiti Ma-mayor nga mang-manok kadagiti kandi-plato, kasuan yo ida ti krimen nga triple K (KKK), “kinamulengleng, kinalaglag, ken kinatorpe”. if you got the three Gs,then no one can beats you here in ABRA except the fellow who also have the same three Gs. but if have an extra G,(guts) then, youre a surefire winner.! Adda nayon na ata Guns, goons and Gold. Extortion ken Blackmail pay! Adda kano surat naggapu opisina ni Jendricks Luna nga mangay-ayab meeting para dagitay adda negosyo da idiay Lagayan. Oktobre 23 adiay miting ket kuna jay surat nga no saan agatendar jay nasuratan nga tao ket saan nga ma-renew lisensiya na sumuno nga tawen. Agpayso atoy? Apolitical? Ketno dita bangir karayan ket unopposed Amin kandidato ta pinaatras Tay mayor dagijay nagattempt nga agngayangay. Uray pay Han nga kayat ti tao dagijay man ok na, Sudan latta ti agtugaw ta maiparit met labanan. God Father, nagdakel ti ballasiw ti karayan, kayat mo sawen Lapaz, Danglas ken Lagayan saan dan nga mabalin nga kalabanen ti adda nga naka puesto? Please elaborate your wordings or you re- phrase which Municipality your pertaining too. Thanks. what do u expect from comatose takit. he’ll wake up when there is pundo nga matakaw. santito latta su nga awan mangeg wenno makita a mukat na. The cry of Abrenio ‘When shall fear and death stop’? Kaanonto nga agsardeng ti buting ken pammapatay.Dutarte style is needed in Abra. 3 veteran killers must be neutralized. Yes only 3 but someone suggested 4. The 4th is interest only of the glare of money . Vigilantes will decide. Iron hand is the need of Filipino mentality. See how Abreco gm Changed when warned by National electric Adm. During Martial law time, crime in metro Manila was zero percent in one week after the declaration. Lord, forgive me but 3 or 4 are nothing, they are worthless compared to the 200 000 or more that are abused! ‘Neutralizing’ 3 or maybe 4 now worthless, greying hitmen, Tagamasid? Is this the trick now – call for the liquidation of these expendable tools when they now have to be retired because either they now know too much or they are not as sleek as before anymore and so they need to get replaced with newer ones? This will then ensure continuous rule of the mastermind – ‘godfathers’ (aka politicos) who commanded them to do the dirty job and who are now itching to replace them for younger ones. This hypocrite Tagamasid loves to quote bible verses but calls for an NPA and Duterte’s liquidation approach of cleansing society. What a contradictory within. Prove your worth like most church leaders of different sects who failed miserably because of true essence of hypo racy. Philippines is the only Christian dominated country entire Asia but doomed to poverty and lawlessness because of hypocrisy. Most Filipinos go to church but behave contrary to the doctrine of love, but self exultation s and self preservation. This is true especially to politicians who valued money more than decency and human lives. Protect them if its your pleasure at the sacrifice of some 99 percent exploited and abused by their demonic standard. Enjoy witnessing their miseries a nd maybe share with the fruit of their loot. This video just showed the arrogance of gob takit. He just does not care at all. He’s on his last term, super rich and the hell he care about Abra.